THE HIGH COURT has granted orders requiring protesters to end their occupation of a premises in central Dublin. Justice Richard Humphreys granted the owners of 41 Belvedere Place, Dublin 1, MJH Property Management an injunction compelling the protesters to immediately vacate and cease the unlawful trespass on the property. The court heard the occupation of what had been a vacant premises commenced on 8 September last when several persons seeking to highlight the current housing crisis forcibly entered the property. 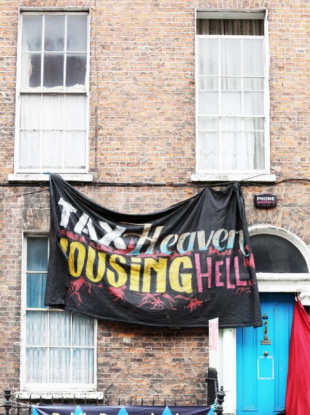 The property is the third north inner city premises, after properties in Summerhill and North Frederick Street, that has been the subject of High Court proceedings after they were occupied by the protesters. In its action, MJH says the property, which it hopes to develop into apartments, is currently unsuitable and not safe for what it says is an illegal occupation. It says that unless the occupation ends its insurance for the building will be rescinded. Last week the UK based owner obtained permission from the High Court to bring proceedings against the persons unknown who it claimed had broken in and occupied the premises. At today’s sitting of the High Court MJH Property Management, represented by Padraig D Lyons BL instructed by solicitor Kieran Curran, said notice of the proceedings had been served on the occupiers of the premises. There were no representations made to the court on or behalf of any of the occupants when the case was called by the court registrar. The owners claim the occupation is part of an organised campaign called “Take Back the City”. The occupation, the owners add, has featured on a website of a group called the Workers Solidarity Movement, which describes itself as an anarchist organisation. Counsel told the court that his client is a UK based property letting and management business, with an office in Dungarvan Co Waterford that acquired 41 Belvedere Place in 2016. It plans to develop the four-storey over basement Georgian building, which is a protected structure into apartments for either sale or letting. It has secured planning permission for four apartments from Dublin City Council. It has applied to build five apartments, but DCC refused to grant permission to build a fifth apartment at the rear of the site. An appeal against that refusal has been lodged with An Bord Pleanala. To prepare for these works it needs access to the building, which it says it is prevented from doing due to the occupation. In a sworn statement Michael Horgan, who is a director of MJH, said that it appeared that there were three persons on the premises. A system was in place where different persons were on the property at different times, and there had been appeals on social media for volunteers to join their group and help with the occupation. Horgan said the building is unsuitable for occupation, and at present is not safe. He said that in anticipation of works plaster on the ceilings and internal walls had been removed. These works affect the overall stability of the building to the effect that without support structures the upper floors might give way. In its current state, he added that the building could not be compliant with fire safety regulations. After granting the orders the judge adjourned the matter to a date in early October. Email “High Court grants orders requiring protesters to end occupation of Dublin property”. Feedback on “High Court grants orders requiring protesters to end occupation of Dublin property”.